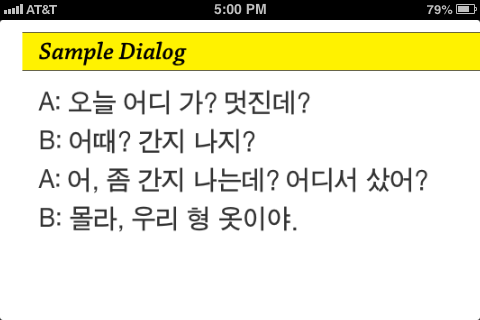 I can say without a doubt that Talk To Me In Korean is my favorite Korean study resource. It has constant updates to add to its existing lessons and it uses really fun and informative videos, audio, PDFs, physical textbooks, pictures, and more (ie social media like Twitter and Facebook) to teach Korean. Since I love TTMIK, I was excited to try their Slang Expressions in Korean lessons (they’re available online at My Korean Store). This great product allows the purchaser to choose which price to pay based on their funds or what they personally think the product is worth and is inexpensively priced at $2.99, $4.99 or $9.99. The Slang Expressions lessons are well worth any price. The package comes as an online download; after purchasing, I waited a few minutes for a confirmation email and then an email with a link to a temporary download. The lesson package can be downloaded a couple times (if you have multiple computers, you can download it to each one rather than spending time transferring with a USB), and the download link expires after about a week (so if you decide to get this, don’t sit around for a month not checking your email and wondering where on earth your Korean slang lessons have gone). The Slang Expressions download came as a zipped folder that unzipped to show four audio files (I copied them to iTunes and added them to my ‘TTMIK Extras’ playlist) and a PDF (if you have an iPhone, download the iBooks app for free, add the PDF to your iTunes books library by dragging it or copying it, then sync that PDF to your phone to study Korean on the go). The four audio files included three lessons – Chapters 1, 2, and 3 – and a great Mini Dialogue Audio Track to practice with at the end of the lessons. 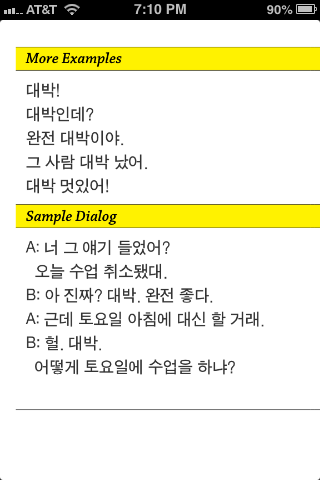 One big reason why I love TTMIK is that their lessons, while being extremely relevant, helpful, and informative, are never boring, and just about every sample dialogue is funny (I often find myself laughing while I’m studying). Each useful phrase is either a common real-life example or a conversation that sounds like it’s straight out of a funny and romantic Korean drama. These Slang Expressions in Korean lessons include some of my favorite funny dialogues. Beyond being funny and memorable, the phrases are surprisingly relevant. I hesitated to buy this at first because the phrases that the product description mentioned seemed irrelevant to most regular conversations – yet the lessons’ examples showed me that these phrases are a great asset to my vocabulary; I can’t wait to begin using them naturally in conversations and understanding their use in music, shows, and real life. I definitely recommend that you check out the sample audio and PDF and then purchase these lessons to add to your Korean study resources. If your Korean isn’t high enough to understand complex grammar and all the ins and outs of how a sentence is put together, don’t worry; these lessons are very simple and easy to follow, and you can always begin by memorizing terms. Save the sentence dissection for when you get to that level. Speaking a language is all about sounding natural, and these Slang Expressions can set you on the right path. NOTE: The majority of the Slang Expressions lessons are in informal language or 반말, which means just because you’re feeling high and mighty and like a G-Dragon perty boy (Crayon? Anyone, anyone?) you can’t just casually use slang to an older person or someone you’re supposed to be polite to. If you’re not sure, don’t use it – in case it’ll offend the other person. You might seem more rude and stupid than fluent and intelligent. Good review! I like your sense of humor with all of the Kpop references ^^ I swear, it seems like everything in life can somehow have a Kpop reference lol. Like when I am shaking something I always sing the part in JJ Project’s Bounce that’s like “shake it up, shake it for me”. I want to get this, but my computer is dumb. I have a lot of trouble with downloadable products so I just avoid buying them now It’s not TTMIK/My Korean Store’s fault though. I still love them! 고마워요! Haha, it really seems that way. And it can definitely help with remembering the meaning of a word or phrase in Korean ^_^ I’m sorry that you can’t download their products – is it due to your browser or your computer that downloads don’t work? I know a thing or two about computers and if I can help I’d be happy to. TTMIK/My Korean Store is 진짜 대박! They’re so nice and helpful.